The Cibola 6 is a 6-inch tall men's boot that is simple and versatile. The chocolate brown leather exterior is slightly distressed giving this boot a lived-in feel and features antique brass non-tarnishable hooks and eyelets for the durable waxed laces. It has 5 Iron Texon® insoles that allow for a comfortable and flexible fit and the Vibram® outsole provides maximum traction on wet or dry surfaces and various terrain. Made in the USA with global parts. My first pair of these boots and have owned It for only one year, and I have some negative experience with them! There coming apart or separated from the sole in the middle section. not sure why "Made In America" made well? I bought two pairs three months ago. Both pairs, the left boots footbed seems to be offset after break-in. My foot feels like it’s not fully sitting on the footbed on the outside edge. Very disappointing. At a sale price of 120 these are far better then most of the hiking/work/anything lether boots I found on the market. At the 4 month mark the lases are starting to give out and the sole is showing more wear then I would prefer for a Vibram. There are some minor welt flaws where the velt was uneven when it was assembled that some boot snob would likely scoff at and the my pair werent totally identical left to right. That all said for a sub 200$ boot these are still pretty darn good. Grip well in the rain and quite comfortable on long days. Normally a 9 sized down a half and they were a perfect fit. The last 2 pair of these boots I owned, I had the same negative experience. They came apart on the toe and separated from the sole. Hey Matt. Thanks for letting us know. Please give us a call at 1-800-548-1021. This is my 9th or 10th pair from Chippewa. I like the fit and style. Never had any quality concerns on any of them. I've had these boots for a couple months now. 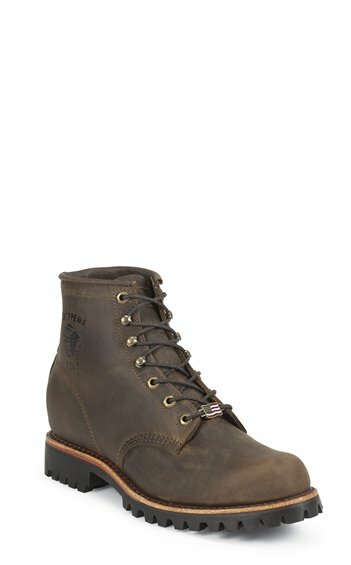 The price on chippewaboots.com was the best I could find anywhere - plus I couldn't find these in my size in any store. They do run a little big, and the leather does stretch so order at least 1/2 size smaller than normal. They hurt like heck for the first day - especially around the ankles, then steadily got softer and softer until they just molded to my feet. Even though I loved the brushed finish I went ahead and waterproofed them with SnoSeal. It darkened the leather quite a bit but they are almost completely waterproof now - good thing since we had a very wet spring! They have just the right rugged look I was hoping for, they are incredibly comfortable and I hope they last a long. long time. Have been wearing these boots for about a week and so far, so good. I LOVE them! Quality, thick leather, good support, just stiff enough to require some breaking in, but also assure me that they're made of quality materials (I've found the new fashion of comfy-right-out-of-the-box inevitably means a shoe that doesn't last and wear well). Have been looking for a good all-purpose work boot and I think I finally found it! Wanted a non insulated boot with great traction for walking the dog in the woods and these are awesome. A little stiff at first but break in quickly. Love them! After reading a lot of mixed reviews I purchased a pair. Out of the box I noticed that the eyelets on the leg boot were off/misaligned by less than an inch, but noticeable. They run bigger than expected, which all the reviews said the same. Hindsight, I should of gotten a half size smaller. Just to give readers an idea, I wear an 11.5 in running and hiking boots, I wear an 10.5-11 in most boots and dress shoes, and a 10 in ariat cowboy boots (US sizes for all). I ordered an 11 planning for that but I probably should have ordered a 10.5 or even a 10 since I think these are sized more like cowboy boots. Having said all that, after breaking them in for about a week they are very comfortable. I will probably buy another pair after these wear out in a few years. I have worn these boots for 9 years of hard work. Very good boots. Needed a new pair and decided to buy from Chippewa direct, saved $65. First pair had a bad right boot. It rolled inwards on the step, sent them back, easy and no problem.2nd set is much better, but not perfect. Stiching is off on right boot. Decided to keep them and give them another try.Hoping for the best! I purchased these boots a little more than a month ago. I have been wearing them almost every day. They have been great. I have had no problems with hot spots or blisters and for me they fit great. I typical wear a size 11M and that is what I ordered. Just wear some light weight to medium weight wool hiking socks and they fit perfect. Great boot and very comfortable. One complaint is they did not come with the American Flag for the laces. I've been buying Chippewa boots for over 20 years. I've always been satisfied with the quality and comfort. Good foot/ankle support and comfortable foot bed with great traction. Plenty of room in the toe box without looking boxy. Just bought these boots. I normaly wear a size 13 with Chippewa but I had to return them for a size 12. Size 12 fits perfect considering im a 13. I ordered a width D and EE. The D is a bit snug and the EE is too wide. I have a normal width foot. I returned the EE and kept the D. I wore them keeping them as the better of the two widths but regret even keeping them. Ill have to go to a shoe shop and hope they can widen the boots. My first pair of these CIBOLA I boots sold me on these being the perfect boot. They fit like a glove and have a great arch suppport. They are lace up then hooked for three rows topped by an eyelet for security. They wear very well. This is my third pair. I also like not having a liner so you can wear them year round by insulating with socks. I can wear these boot with work, play, or business casual. Plus their made in the USA! I bought this boot a month ago. My second pair of Chipewas. Excellent boot. Have worn for 4 hours at a time every day for a week working on steep sloped property to lake. Stick ups, vines, cutting trees, clearing brush piles - dangerous terrain. I needed a solid lace up to keep my 66 year old body from rolling to the lake. Did a fantastic job. Looking to buy a pair of pull ons for the less strenuous activities around my house. Earlier purchased snake boots have been excellent as well. Chippewa is my go to boot company. thanks very much for such a great product. My son and grandson were both commented on how cool they looked - will have to watch them closely. hope this helps someone make a good call - I did buy a half size smaller based upon reviews and they fit perfect. 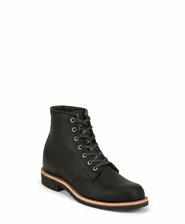 I am in the UK and I bought 2 pairs of these boots to save on shipping costs. Sadly, both pairs of boots failed in exactly the same place; the stitching at the heel (after only 6 weeks in one pair and 4 weeks in the second). I have been to the cobblers to enquire about a repair only to discover that this will cost nearly as much as a new pair of boots! It is a great shame as they are super comfortable and and great looking boots. Having seen the other review concerning failed stitching I can only imagine that there is a bad batch out there. Work boots in the UK are unimaginative and often full of synthetic materials. I really bought in to the idea of the hand crafted US boot only to discover they're not all that either. What a pity. I bought these boots just over a month ago. Today the stitching that holds the upper to the sole fell apart at the welt. I use these everyday for work as an Air Conditioning Mechanic and do a lot of kneeling and bending. For the past 20 years I have used Red Wing Boots and decided to give Chippewa Boots a try. What a mistake I made... As the picture shows, the out soles have minimal wear and tear, in fact there is hardly any, because they are a month old. Apparently this is what we call "Made in America" quality. These are awesome and very comfortable boots. Customer service is Excellent! My experience I was able to email and receive a reply the same day. You will want to order these boots one full size smaller than your shoe size. Great product and great service, I will purchase Chippewa again. I have had these boots for about two months. I have wide feet and have a hard time finding a good fit. These may be the best fitting most comfortable boots I have ever owned. I wear them almost every day. These boots were recommended to me by the owner of Nokomis Shoe Shop in Minneapolis, I have been wearing this style of Chippewa for many years. They are rugged and comfortable. I believe the classic design adds to their durability. Combined with good wool socks they are comfortable all day on and off the job site. This is my first pair of Chippewa boots. I usually wear Danners, I wanted to try something new. These may be a game changer. I work as a rough frame carpenter and bought these boots to wear in the summer. It turned out to be a great idea. They work great, I wear them all the time. They are very comfortable ....it took a short period to break them in. They are not waterproof but clean up well.....saddle soap seems to work well. Only had the boots for 3 weeks Wear them every day Great fit and comfortable right out of the box!